A call to Ocean Independence in Antibes brings news of a €1 million price reduction on the 37m new build motor yacht project Maxima, a joint listing with Eric Trupheme and Jeroen Minnema. 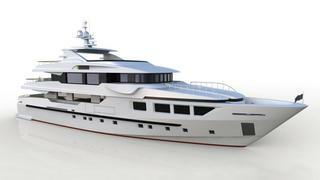 This superyacht is to be built by Italy’s Tecnomar yard with delivery due 20 months after signature of contract. RINA classed and MCA compliant, she'll accommodate 10 guests in five suites with various layout options available. Powered by twin MAN 2862 LE463 engines, Maxima will have a cruising speed of 13 knots and a range of 3,000 nautical miles at 12 knots. Maxima is now asking €10.9 million.